Writing your own vows is a wonderful way to personalise your ceremony. But many couples are put off even trying because sitcoms, together with uncountable numbers of websites, give the impression that writing vows is time-consuming and difficult. Traditionally vows include topics of love, life, partnership, and individuality. That would seem simple enough. So why is there an almost universal belief that writing your own vows is difficult? Well, it just might be (actually it is very likely) that the model of personal vows we have firmly imprinted comes from the American way of marrying. Let's look at that for a moment. The notion of personal vows developed in the 1970s as more and more couples wanted to put their personal stamp on their wedding ceremonies. But back then, most people married in church, where the liturgy was laid down and locked in, or in a standard one-size-fits-all civil ceremony (which in the US means what we think of as a courthouse or Registry Office wedding) where saying "I Do" in answer to a question about whether you take one another for husband/wife, is the legal equivalent of the Australian statement that has to be made by each of the marrying couple. So only place where there was room for anything personal was the addition of personal vows, which quickly became the repository not just for personal promises of each to the other, but the vehicle for telling their story. Quotes, poetry, etc etc - what I call "channeling your inner Shakespeare, Hallmark Card, or favourite singer/band"
If, however, you look at the context of your vows within your Australian ceremony, you can ignore the formula and concentrate on Number 6 and pretty well ignore the rest. You don't need to tell the whole story of your relationship in your vows. Writing your own vows gives you a unique opportunity to make personal promises that express, in your own words, your intentions for your marriage (think performance targets! ), together with your commitment to one another. The motive for your vows is love, but the promises you make should include more than feelings, they should be actions describing how you are going to treat one another, and what sort of person you are going to be within your marriage. Regardless of whether you are planning to write your vows together, intending that you will both make the same promises, or planning to each write individual vows, these four questions need to be thoroughly discussed between you before you put pen to paper. If, after this discussion you can each write down the answers to these four questions in some simple words and phrases you are half way to writing your vows. The important thing is not to worry about writing beautiful vows on the first try. Join your dot points together, making sentences that tell the story of the kind of person you intend to be in living your marriage committed to your spouse. While it is both traditional and common for both of you to recite the same vow, this is not a legal requirement. In addition to the legally required words, you can each make your own personal vow. I encourage couples to work on their vows together because exploring what you are committing to, and how you both want to be within your marriage, is a relationship-strengthening activity. It is a good idea to have these conversations even if you've decided to write individual vows and keep them secret from one another (but not from your celebrant!) until the ceremony. How long should your vows be? Don't worry if you "write long" to start with. As someone once commented - it takes longer to write a short vow than to write a long one! That's because a process of distilling will add punch, and increase the power of the words, but it takes a little effort. When you've got that first draft done is time enough to consider how long your vows will take to say [Hint: Normal speaking speed is about 120-140 words per minute.]. So, get out your smartphone, start the stopwatch, and start reading. 15 to 45 seconds: Just about perfect. 5 or more minutes: Guests will glaze over and tune out if you ramble on. Get out your red pen! Double that time if you're repeating after your celebrant. It is those words that create your marriage. But those are the extent of the changes permissable. And any personal promises you make must be unconditional. 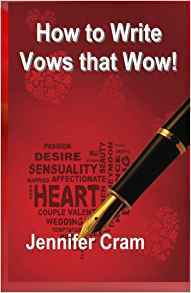 When you book your ceremony with me, I will give you a digital copy of my best-selling book, How to Write Vows that WOW!